It supports animated GIFs as slides, which is a rare and unique feature. You can add notes to slides to help you remember the important things related to a particular slide. 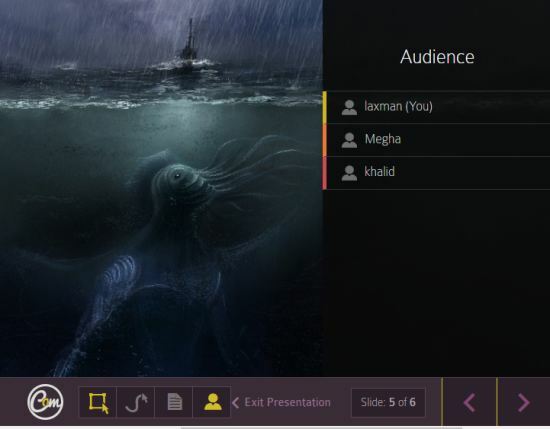 The presentation can be shared remotely on different networks. You can also check the total number of viewers who have currently opened your presentation. During the presentation, you can focus on a particular part of the slide and can also use a pen to annotate. Only you can control the presentation. That means, only when you change the slide, only then viewers will be able to see the next slide. This feature might also be considered as a restriction, but it is good when you want to let others see only what you want them to see. As you see, some really fantastic features are available on this website. I also didn’t find any size limit for presentation and the total number of presentations that can be stored after creating the free account. Perhaps the website supports unlimited presentations. All the presentations can be accessed from the dashboard. A presentation can also be archived, if needed. How To Create and Share Presentation Online Using This Website? Step 1: You need to create a free account by accessing the homepage and then you can create, store, and share presentations. Step 2: Once the account is created, you should create your first presentation. For this, you need to drop images as slides on the given box. JPG, GIF, PNG, and animated GIF images are supported. For each individual slide, there is an option to add a note. You can also delete any unwanted image if uploaded by mistake. Apart from this, it provides options to set the background color and position of slides. You need to insert hex code of a color to change the background. 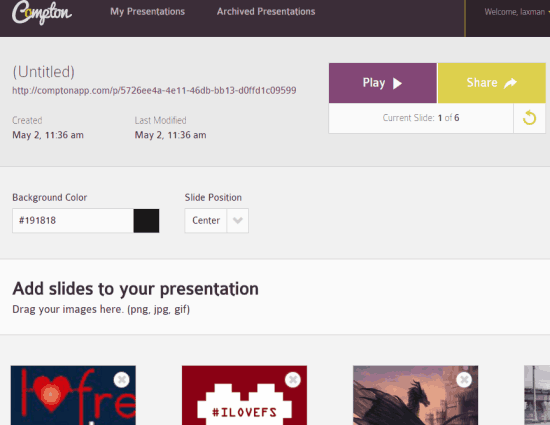 Step 3: When the presentation is ready, you can play it or share with others by generating the sharing URL. Others won’t be able to view the presentation unless you Start it. Check the total number of audience. Move to next or previous slide. Open notes (if any) associated with a slide. 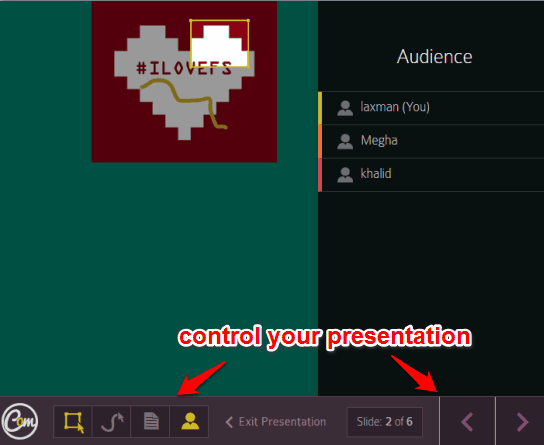 This way, you can control your presentation. You can also exit the presentation anytime you want. This will end the presentation for viewers automatically. Compton is indeed a fantastic website to create and share presentation online. From Creating, storing to sharing the presentation, everything is really simple. Try it.